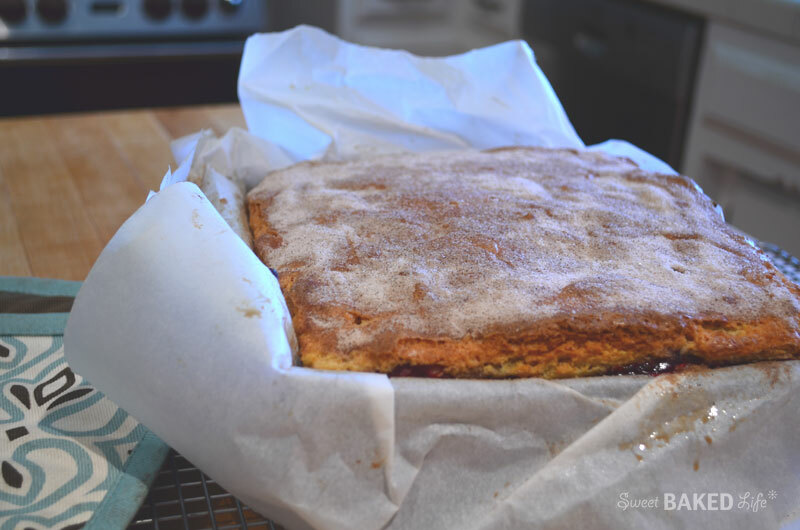 With spring upon us, and the delicate pink and white flowers of the cherry trees swaying in the breeze, I was inspired to celebrate the season by making this scrumptious Cherry Blossom Cake! This recipe is super easy to prepare and deliciously satisfying to eat! 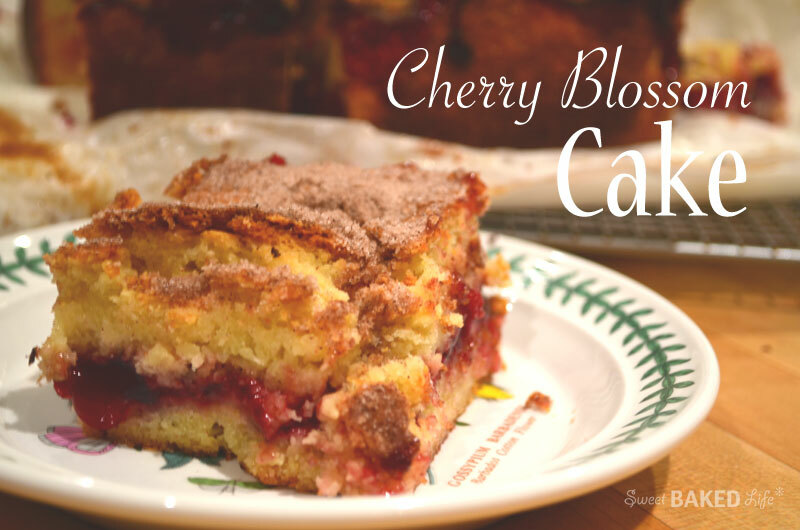 I especially like the crunchy cinnamon-sugar topping against the delicate cake fused with cherry filling — a truly wonderful combination! Heat your oven to 350 degrees. Prepare an 8-inch square baking pan with cooking spray, then line with parchment paper, with overhand on all four sides, and spray again with cooking spray. Set aside. In a large mixing bowl combine sugar, butter, orange juice, eggs, and vanilla and whisk until sugar is dissolved and everything is completely combined. Fold in flour, baking powder, and salt. Note, the batter will be thick. Pour (or spoon) half of the batter into prepared pan, spread evenly then add the cherry pie filling. With a knife, gently swirl the pie filling into the batter. Add remaining batter and spread evenly over the top. Sprinkle cinnamon sugar mixture over the cake. Bake approximately 1 hour, or until a toothpick comes out clean. As a note, my cake puffed up quite high, so you will need to use a long toothpick or wooden skewer in order to fully check for doneness of the cake. Cool completely on a wire rack. Lift the cake out of the pan by the parchment paper, put onto cutting board, and cut into 12 large squares. This cake makes the perfect snack, dessert or scrumptious breakfast treat!